Pre-War French Tinplate Clockwork Toy Armoured Car. There are no manufacturers marks or country of origin but we think this example is of French origin, particularly given the drivers helmet shape and Gallic nose profile. The side and underside is stamped'FOREIGN' so it would have been a British import. It has a sparking action and a rocking drivers head. It is finished in an olive drab colour. Given the vehicles shape we would date it to the 1920's if not earlier. The key is not present. The car has a length of 4.15 inches (10.5 cm), a height of 2 inches (5 cm) & a width of 1.75 inches (4.5 cm). The car weighs 77 g. The car has minor surface corrosion in a few places and loss of paint, most noticeable on the right running board. The rear right wheel is loose on the axle. The detail on the drivers head is still clear. The sparking mechanism requires a flint. For further details and condition, please see images below.. 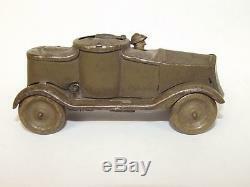 The item "Pre-War French Tinplate Clockwork Toy Armoured Car" is in sale since Tuesday, January 21, 2014. This item is in the category "Toys & Games\Vintage & Classic Toys\Clockwork/Wind-Up".